STORMINSPANK'S HAWKEYE RAMBLINGS: You Thought Jordan vs Bird Was Awesome? You Thought Jordan vs Bird Was Awesome? This summer's session of the PTL gave the Hawkeye Basketball faithful a shot of adrenaline. A lot of fans came away from the summer league excited about this year's team. In fact, someone even made mixtapes of both Devyn Marble and Aaron White from their PTL highlights. 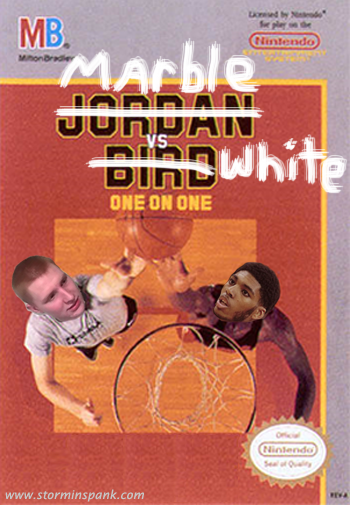 In fact, one Hawkeyenation poster went so far as to dub Aaron White the new Larry Bird. I say we roll with it. College athletic endorsements be damned. Pull out the old NES and pop in this brand-new game.